Stockton Dirt Track - San Joaquin County Fairgrounds - Sprint Cars, Modifieds, Motorcycles and other events on dirt! **New improvements to the track in October 2016 include the lightning fast clay oval has had the front stretch brought closer to the grandstands, something many fans have asked for since it debuted in 2013. A new flag stand has been built to go along with the new scoreboard that debuted in July 2016. The track has gone from 3/8 of a mile to 4/10 of a mile with the improvements taking place. The sweat stings on his cap and the earthen smudges on his flannel shirt are unmistakable clues that Tony Noceti works in the dirt. Farming thousands of acres in California's San Joaquin Valley. Noceti grows wheat and other crops in a part of the country that produces a lot of what the rest of the country eats. But Noceti's most recent cultivation has nothing to do with dinner. After sculpting dirt like an artist and nurturing it with water, Noceti's most recent harvest is the country's newest dirt track, the "new" Stockton Dirt Track. The 3/8th-mile oval is built inside a weathered and seldom used one-mile horsy track on the San Joaquin County Fairgrounds in a city that sits on the edge of the delta that feeds San Francisco Bay from the Sierra Nevada Mountains. Because private land is so prohibitively expensive for this type of construction in the Golden State, the Stockton track is the first clay oval in California since Perris Speedway, also located on a county fairground, which open in 1991. The new Stockton track fills a vacuum created by the closure of racetracks in recent years, such as the now defunct San Jose Speedway and Baylands Raceway Park in the highly populated San Francisco Bay area, about an hour's drive away. "Stockton is so centrally located and there is such a desire and a need to build a dirt track around here," says Carol Noceti, explaining why she and Tony built the new facility, especially during tough economic times. The pent-up demand of Bay area sprint car fans was obvious at the track's opening race in late March 2013, which featured the World of Outlaws. The 7,000 seat grandstand was as full as a circus clown car, with fans practically spilling over the sides, and standing in the aisles and on every available inch of an expansive asphalt concourse. Many observers thought it was the largest single night crowd in years to see a sprint car race in California. "We didn't bring in any new dirt," explained Carol Noceti. "We just moved the dirt that was already there to build the track," she added. Much of the infrastructure the track needed, including the grandstand, some lighting and the public address system, was already in place. Still, it was a minor miracle that the banked oval was carved into the infield of the horse track in just two weeks. Two days before the race, work crews were busy planting flowers in victory circle and the flagman standing in a cherry picker on the infield was evidence of the hurry-up pace of the work right up to opening day, with more that needs to be done. Tony Noceti, a former modified and stock car driver and car builder dating back to the 1970's, has become the speed savior of Stockton. Two years ago he and Carol rescued the quarter-mile asphalt Stockton 99 Speedway across town, which had sat unused after 60 years of every Saturday night racing, occasionally including USAC sprint cars and Bay City Racing Association midgets. Carol and Tony also built and manage two other racetracks on the San Joaquin County Fairgrounds - one for karts and Delta Speedway, which runs mini-sprints and micros adjacent to the new track. Actual construction of the "new" Stockton 99 Speedway took weeks, but the effort to build it was years ago. "We approached the fairgrounds four years ago about building the track and they didn't even want to talk to us because horse racing was so strong." recalled Carol Noceti. Talk last winter were more successful because of what she calls "a perfect storm." A recession and a municipal bankruptcy by this town of 300,000, combined with horse racing in California that went as lame as an old claimer, made county officials more receptive to the Noceti offer. Carol noted that Tony began building racecars in 1974, "since he was too young to drive." Noceti relied on that experience in deciding the size of the track, which he believes provides a compromise between the fans' desire for entertaining, close racing and what racers can afford. A bigger oval would have meant bigger bills for racers for things like tires, gears and engine wear. "With the economy we have right now, we have to be sensitive to the cost of racing," noted Carol Noceti. "But we needed the track to be big enough to draw big shows." Steve Kinser and the gang, which also included Tony Stewart and NASCAR's newest rookie sensation, Kyle Larson, who flew up from their stock car gig in Fontana for the night, was the kind of blockbuster big show the track needed to make a good first impression. That the race had a dramatic finish, with Northern California native Larson winning with a bold pass on Tim Kaeding in the closing laps, made the track's debut the water cooler conversation of the week among local fans. The quality of the show also was a testament to Noceti's ability to preserve a racetrack that was in jeopardy of being blown away before the first hot laps were ever turned on it. The forest of windmills that cover the coastal hills near Stockton produce electricity for the local utility and are a testament to the strength of the winds that blow up from the delta from San Francisco Bay. A constant 40-mile-an-hour wind made race day feel like a bad day on the Kansas prairie and threatened to blow the track surface all the way to Sacramento. But Noceti and his crew were as relentless on defense as the wind was on offense, combating it with water trucks all afternoon. That not only preserved the track, but prevented most of it from going dry slick even after a night of racing. The box score will show that at least a dozen cars got upside down in turn two on the track with no walls. But, the biggest reason for the carnage was the inability of drivers to run up against a cushion. Instead, one driver after another slammed into it as if they were running head first into a wall. "The track has a lot of potential." 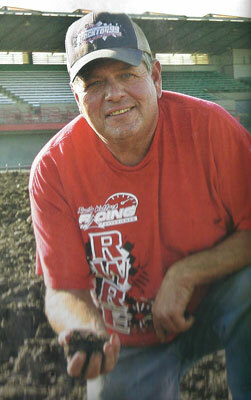 contended Kraig Kinser. "It usually takes a couple of years for a dirt track to settle, but the dirt stayed together really good for the first race," he added. "Plus, it was nice and wide and you could race on the top or the bottom." Tony Stewart, who has seen his share of dirt tracks - good and bad - paid Noceti and his crew a high compliment. "It was the best first night racetrack I've ever seen," said Stewart. "Normally, the first night on a track is a minefield and the promoter doesn't know what he has to work with until you race on it. I told the promoter he should take his track prep guy out to dinner." Despite its temporary look, the track plans to be a permanent part of Northern California's sprint car scene, although it will run only special events to compliment the regular schedule of other dirt tracks in the region. "There are enough local tracks running weekly shows for the diehard fans," said Carol. "We plan to put on big shows to draw attention to the city and to help the fairgrounds stay open." The 2013 schedule includes all of the area's top winged and non-winged sprint car series, including USAC, King of the West, Civil War and World of Outlaws, in addition to modifiers and other special events. Tony and Carol have already beaten long odds to make Stockton's racetracks successful. "We re-opened Stockton 99 at the worst possible time, when the economy was turning," said Carol, "and we preserved the horse racing lobby, county bureaucrats and the wind, it's a good bet they will persevere again running America's newest racetrack. ©2013-2018 Stockton Dirt Track • Noceti Group, Inc.